Temple Of Doom (above) set a world record at Tioga Downs on Sunday. Some of the best sophomore trotters in the world were gathered at Tioga for the 36th edition of The Harry M. Zweig Memorial Trot. Lucky Chucky was the horse collecting the headlines heading into the race, but in the first $134,965 division of the Zweig Memorial, Temple Of Doom and David Miller stole the show with a world record performance of 1:52.4 for 3-year old colt trotters on a five-eighths mile track. The duo left from post position number five and trotted through fractions of :27.1, :57.2 and 1:25.1 before sprinting away from the field with long powerful strides with a final panel in :27.3. 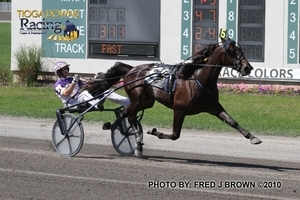 The mile eclipsed the world record set exactly one week ago by Lucky Chucky and John Campbell at Harrah’s Chester of 1:53, which was shared with Explosive Matter (Ron Pierce) from 2009. Temple Of Doom posted only the second win of the career. The 3-year-old son of Yankee Glide-Armbro Temple is trained by Jonas Czernyson for Robert Rosenheim Stable. Until Temple of Doom produces again, you have to wonder if he is a one race wonder. Much like Land Grant in a 1980′s edition of the Woodrow Wilson Pace. The age of live horse racing at New Hampshire’s Rockingham Park is over. Rockingham Park President Edward M. Callahan says the decision to limit the location to simulcast thoroughbred, harness and greyhound racing came because of increased fees imposed by the state. Timothy “Ted” Connors of the New Hampshire Racing and Charitable Gaming Commission calls it a sad, dark day for the state. Callahan says the decision had to be made now to give 850 horsemen and seasonal employees time to make other arrangements for the summer. My prediction for 2010 that a horse track would closing its doors has sadly come true. In light of the financial condition of the industry, I expect this won’t be the last. 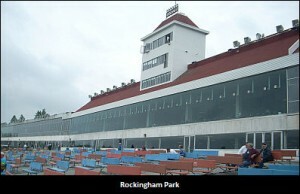 Personal note- I went to Rockingham Park once with my father during the 1980′s. It was during one of my only two ever visits to New Hampshire. Last week I blogged about police and regulators in Michigan looking into whether races were fixed at Michigan area horse tracks. ESPN’s Bill Finley has an interesting take on the subject. The thought of race fixing conjures up images of bad guys sitting in smoked-filled rooms deciding which horses are going to be stiffed, how they’re going to bet the bogus races and how they’re going to divide up the huge loot they’re going to make. It’s the last part that is the key. Race fixing involves greed and greed involves making money, usually lots of it. In Michigan, anyone in the race-fixing business would be lucky to make minimum wage. Harness racing in Michigan is small-time stuff and the pools at the state’s track are pathetically small. The feature race Saturday night at Northville Downs, the only track currently racing in Michigan, was a conditioned race with a $5,600 purse. The best race on the biggest night of racing during the week, it attracted all of $8,782 in wagering in the win, exacta, trifecta and superfecta pools. After the takeout, roughly $6,800 was returned to winning bettors. In order to fix a race, you’d have to have at least three drivers in on the scam, not to mention some gamblers and maybe even a trainer or two. At the very minimum, five people would have to be involved. Much of the pool would be taken down not by the race-fixers, but by gamblers who honestly stumbled onto to the winning numbers. Whatever the exact math is, there’d be nothing but a few crumbs left for the five or so bad guys after they divvied up their winnings. Anyone in on a fix would be lucky to walk away with a couple hundred dollars. The betting figures out of Northville last Saturday were not an aberration. Hazel Park handles the most of any Michigan harness track. It averaged $89,612 per card in handle for 2008, according to the most recent Michigan Gaming Control Board report to be released. The average daily handle at Sports Creek in 2008 was $24,238, which comes out to about $2,000 per race. Imagine making your living fixing races at Sports Creek. You’d be on food stamps. Would anyone fix a horse race, risk their career and jail time, for, at the most, $200 or $300? I suppose it’s possible, but it’s hard to believe anyone could risk so much for so little. Finley goes on to wonder if investigators really understand horse racing. If the take numbers Finley cites are accurate, I don’t see how fixing would be on these tracks for the same reason he does. That goes my usual inclination to believe if an investigation is under way in sports, that there has to be substance to it. I grew up being taken from one Midwest race track or county fair to another*during the years 1971-1974. In late 1973 over 20 people(including some of the country’s most famous drivers) were arrested in the New York area for fixing superfecta races. I remember this huge scandal very well but it is almost forgotten today. The handles in 1973 by the way were many times bigger then today. Most of those arrested were found not guilty in court, but this and some of my father’s stories about drivers holding back, I’ve always taken a jaundiced rule when the possibility of race fixing surfaces. This time I want to see more and won’t jump to conclusions. *- I grew up on Long Island but my father’s horses raced out of tracks in New Jersey, Ohio, and the Chicago area. New York city are tracks had strict rules about minors attending the races. In fact I can count the times I saw races at Roosevelt and Yonkers on on hand. Whereas I been to Freehold, Atlantic City, Brandywine, Scioto, Sportsmans Park, and a couple other tracks probably 200 times all combined. Starting Wednesday, Feb. 24, Meadowlands bettors will be given additional handicapping information for each race. In most races, there are several drivers who are named to drive more than one horse when entries are made. Drivers have to decide which horse they will drive a few days prior to the printing of the racing program. A new television graphic will now show these choices. If a driver was listed on multiple horses in a race, the graphic will list those horses and indicate the drivers choice. “Many bettors feel driver choices are one of the most important handicapping angles at the track and several of our fans have requested a way to obtain that information,” said director of simulcasting and track announcer Sam McKee. This is probably more related to simulcast rather than live racing. When I’ve been to the horse races, any change of driver or scratches were announced as betting opened on that particular race. It is very important to know who is in the sulky when betting a harness race. In my early betting days, my father laughed when he heard I bet on a horse driven by Al Olori(?). Dad said to me “He can’t drive around the track without the help of a map.” The horse I bet on finished 6th or 7th and I learned an important lesson. It is not often that some aspect of Harness racing gets written up in the New York Times. Meadowlands Racetrack has had some of the highest-quality harness racing in the country and dozens of the sportâ€™s most important races. But in recent years, the track has become a money-losing drain on the state of New Jersey, which now threatens its survival. A report issued this month by a committee put together by Gov. Christopher J. Christie before his inauguration to come up with solutions to the financial problems of the New Jersey Sports and Exposition Authority made several suggestions that, if put in place, could all but gut the stateâ€™s racing industry. The suggestions included possibly closing Meadowlands Racetrack and drastically reducing the number of racing days at Monmouth Park. The Sports and Exposition Authority is a state-run agency that owns the Meadowlands, Monmouth Park and portions of the stateâ€™s off-track betting system. The committee projected that the Meadowlands and Monmouth would lose a combined $22 million in 2010, a loss some lawmakers find difficult to justify given the stateâ€™s fiscal crisis. In the report, the committee insisted that â€œthe status quo is not sustainableâ€ when it came to New Jersey racing. I’m well aware of the financial realities the horse racing industry is facing at present. In spite of infusions of public money, or more often than that the addition of some form of casino gambling to race tracks, the sport continues to struggle. There just aren’t as many people interested in the ‘Sport of Kings’ as there were when my father took me and my other siblings to the races in Pennsylvania, Ohio, New Jersey, Deleware, and Illinois when we were growing up. Here are just a few of the posts I’ve written on horse racing’s financial woes. *- Like the Meadowlands which hosts ‘The Hambletonian, Pimlico hosts another one of the sports grandest events- ‘The Preakness. When tracks like these can’t make money, it should be a clear sign just how troubled the sport is. **- This post which was about New Jersey horse racing difficulties, was posted on 1-22-08. I’ve got many more posts like the six listed above. Since I began contributing at OTB Sports in May 2006, there have been 74 horse racing posts written. Over 30% of which we re on the sports’ dire financial condition. Should the state of New Jersey bail out the industry? Absolutely not. I love horse racing but the industry if it can’t survive on its own should cease operations. The government shouldn’t be in the business of trying to prop up any business. Public resources should be used for something more fruitful, not be wasted on something that will fail eventually even with the assistance. On a side note. Why did the NY Times use a thoroughbred racing photo to accompany an article that specifically states harness racing in the very first paragraph? Harness racing is to horse racing, what the LPGA is to professional golf, a Rodney Dangerfield. Harness racing, even when its greatest events are taking place, barely get noticed by the media. No one need look further than both sports 3-year-old Triple Crowns. Has The Messenger Stakes, always raced in the New York City area, ever been on network television. I know it hasn’t from 1970 on. Simulcast operations at Hiawatha Horse Park in Sarnia have been shut down while contract negotiations with the Ontario Harness Horse Association (OHHA) continue. A notice posted Saturday on the Standardbred Canada website states that Hiawatha’s management has been unable to secure a contract with its horsemen. “Due to the unsigned agreement, OHHA has decided to close down all simulcast and HPI wagering through Hiawatha Horse Park,” the statement reads. A difference of opinions that will lead many track employees to lose their jobs till racing begins again in May. Doesn’t the North America horse racing industry have enough problems? Lack of racing will even further bettors to stop betting on the ponies. Note- Hiawatha, which is about one hour from Detroit, has live horse racing from May to October and other forms of gambling all year long. With director of racing operations John Yinger quick to point out that they are not major increases, things are trending upward in the purse and handle categories at The Isle Pompano Park. The Dec. 23 program marked the implementation of purse hikes ranging from about 2.5 percent to over nine percent in some categories. For $4,000 claiming pacers and trotters, the purse is increased from $3,200 to $3,500; for the $15,000 claiming pacers four years of age and under, the purse is increased from $6,800 to $7,000; for $12,500 claiming pacers, the purse is increased from $6,800 to $7,000; and in the non-winners of $6,001 in the last five starts condition, the purse is increased from $6,800 to $7,000. “This is just a slight purse bump in a few classes where we felt it was needed and it was possible at this time” says The Isle Pompano Park’s race secretary Greg DeFrank. While this is certainly good news, the most interesting part of the article is yet to come. As for handle, the final two programs before Christmas produced the best nights of the meet since racing resumed on Sept. 19. Wagering on the Dec. 21 program topped $231,000 and on the Dec.23 card the recorded handle was a meet high at just under $400,000. So Christmas is apparently a good time to go to the horse track for some people? Many years ago, my father would take us to Florida at holiday time partly so he could go to Pompano Park where some of our horses were stabled. 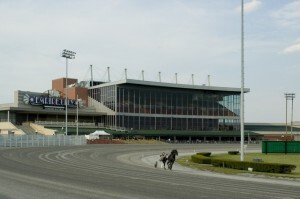 The New York State Racing and Wagering Board on Tuesday ordered four off-track betting corporations in the state to pay Yonkers Raceway several million dollars owed as part of legislation passed six years ago that guaranteed that harness tracks would not be financially impacted by the nighttime simulcasting of Thoroughbr ed signals. The ruling comes in addition to monies already owed to Yonkers. Earlier this month, New York City OTB filed for Chapter 9 federal bankruptcy protection, listed Yonkers as one of its two top creditorsâ€”along with the New York Racing Associationâ€”with $18 million owed. There is some question whether the New York City OTB will ever be able to pay the money. The Board said that the New York City OTB owes Yonkers an additional $3.6 million, while Nassau OTB owes $1.8 million, Suffolk OTB owes $1.2 million, and Catskill OTB owes $940,000. I wish the owners of Yonkers Raceway good luck in obtaining the money owed to them. They will need it. Raceways, racing associations, and off track establishments that are convenient for bettors, are having trouble surviving and this all started occurring before the recent economic downturn. Horse racing in the United States is dying. I don’t think anything can change the course the industry is on to extinction.